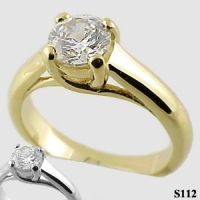 Stock #S112SS: Very popular, contemporary Lucern solitaire ring. Nice, heavy, top quality ring. Beautiful Russian Cubic Zirconia. Also available blank to mount your stone. Matching Band is part number HR112SS.